The 2015 Sea Turtle Program at St. Catherines Island continues to be very successful in conservation, eduction and research. The program set new records, taught more students, published three papers, engaged in two interdisciplinary studies and took the program international. The loggerhead sea turtle (Caretta caretta[Linnaeus, 1758]) is the most common sea turtle nesting on southeastern Atlantic beaches. The species also inhabits the tropical and temperate zones of the Atlantic, Pacific, and Indian oceans. The loggerhead is among the world’s largest turtles with a carapace length of 75 to 112 centimeters (29.3 to 43.7 inches) and weighing as much as 159 kilograms (351 pounds). Loggerhead sea turtles spend most of their lives in the deep ocean or feeding in nearshore coastal waters. They only come to land to nest. 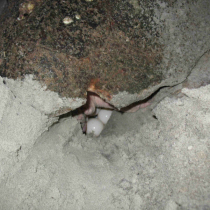 Loggerheads nest on Georgia beaches between early May and early August; their eggs take about 60 days to incubate and hatch between early July and early October. 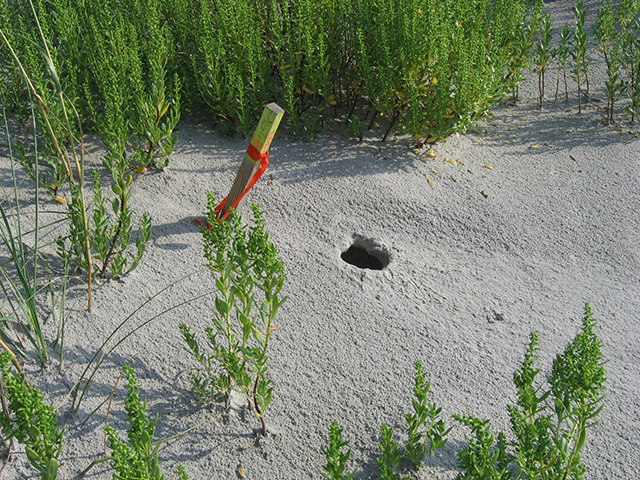 Their nests, dug above the spring high-tide line, hold an average clutch of 113 eggs. 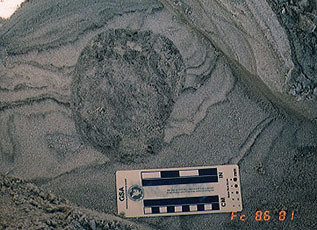 Individual female sea turtles deposit from one to nine clutches of eggs per season at two-week intervals, but do not nest every year. Hatchlings incubate in the warm beach sand, hatching and emerging after 55 to 60 days and heading immediately to the Atlantic Ocean. 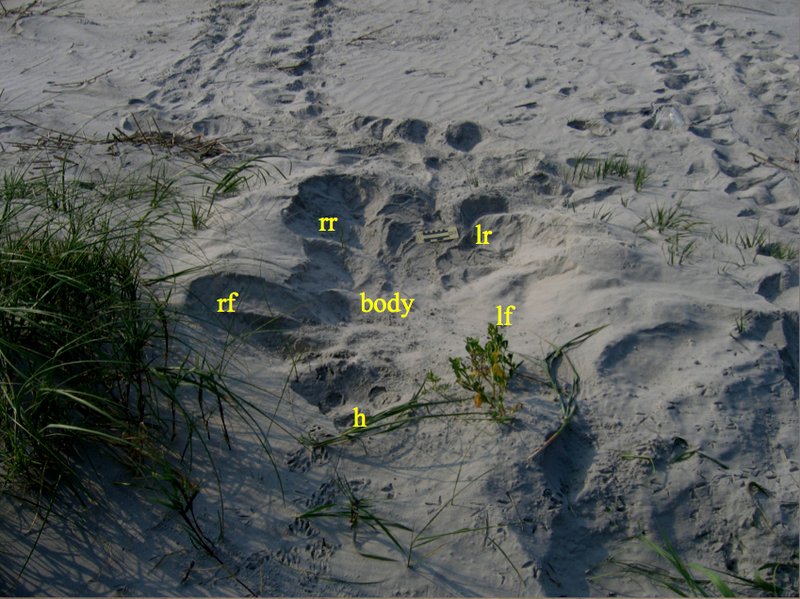 Crawling back to the Atlantic Ocean, leaving components of traces of the Nesting Ethogram, detailed below. 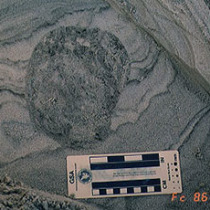 The nesting behavior of all sea turtles, including loggerheads, is hard-wired into their brains. 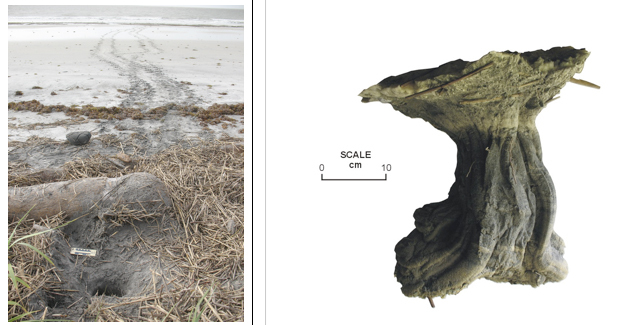 Because of this they typically nest in a predictable sequence of discernable, discrete events, called an “ethogram,” as studied in Florida by Hailman and Elowson, (1992). 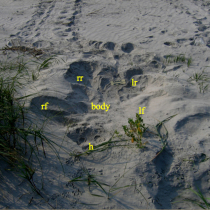 Each of the discrete steps of the loggerhead nesting ethogram produces a reasonably predictable marking or trace on the beach. 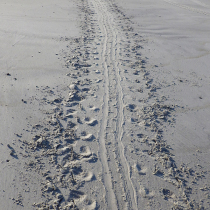 Each of these activities leaves its unique signature on the beach, traces that can be “read” by the conservationist to track the various steps. 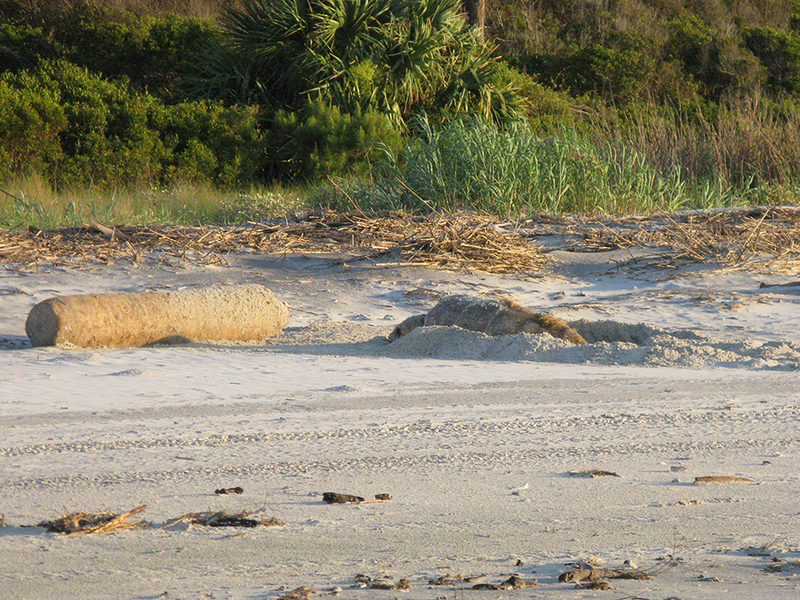 St. Catherines Island—with its 18 kilometers of beach—has approximately 10 percent of the loggerhead sea turtle nests in Georgia, averaging 112 nests over the last five years. 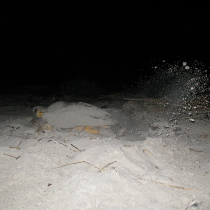 In 2012, a record 185 nests produced 13,229 hatchlings and in 2013 a new record of 192 nests produced 15,580 hatchlings, finally helping bring Georgia’s endangered loggerhead sea turtle population into statistically significant recovery! The species is federally listed as “Threatened” and listed as “Endangered” in Georgia. The species has declined throughout its range. In the ocean, incidental capture in fishing gear takes many individual turtles. 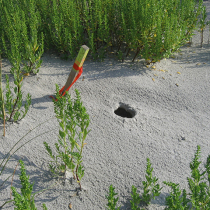 Reproduction has been reduced due to, nest predation (raccoons, wild hogs, and other predators), hatchling mortality (ghost crabs, birds, and fire ants), and especially the loss of beach habitat. 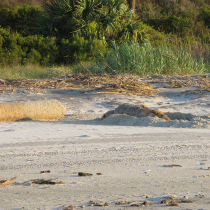 The 2008 Loggerhead Recovery Plan outlines the conservation actions for loggerhead sea turtles. 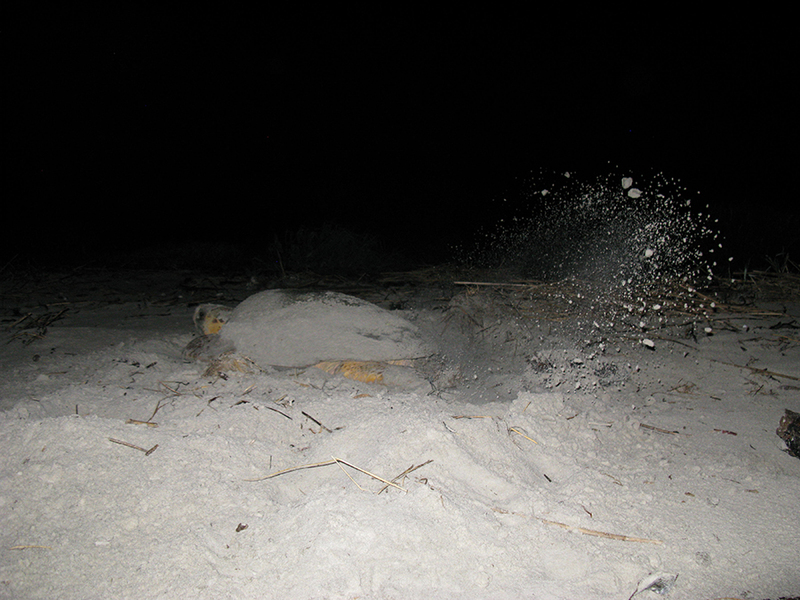 These actions focus on protecting nests and monitoring trends in nesting and nest emergences. 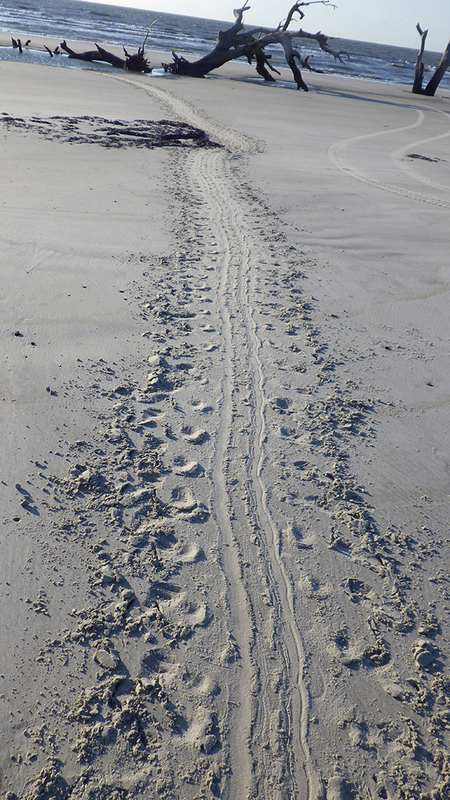 In 2014, St. Catherines Island’s beaches were designated as “Critical Habitat” for nesting loggerhead sea turtles. 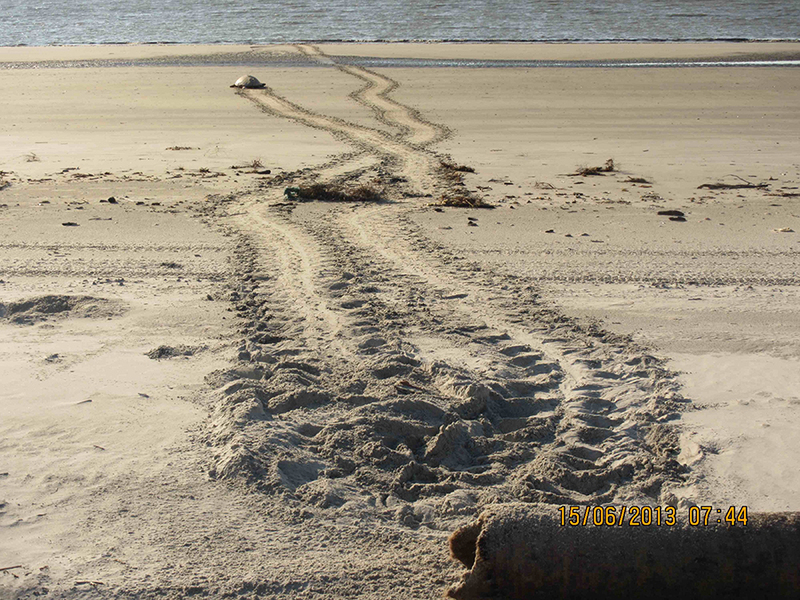 More than 87 percent of the beaches of St. Catherines Island are now severely erosional, causing rapid deterioration in sea turtle nesting habitat. 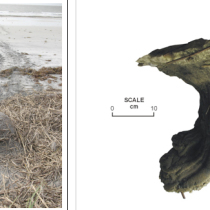 Geologists involved in sea turtle conservation on St. Catherines Island, Georgia, have documented deterioration of sea turtle nesting habitat during sea level rise during the so-called The Modern Transgression. 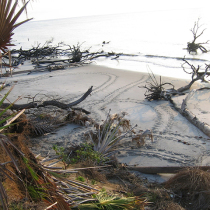 Deterioration of habitat (declining from 25 percent to 12 percent adequate habitat in a decade) has resulted in rapid erosion of backbeach nesting habitat at approximately 3.0 to 6.0 meters per year, including fragmentation of three beaches in 1990 into eight beaches in 2013, formation of washover fans and wash-in fans onto backbeach marsh meadows and into maritime forest, formation of nearly continuous tree “boneyards,” scarps, and relict marsh mud exposures along most of the beach. 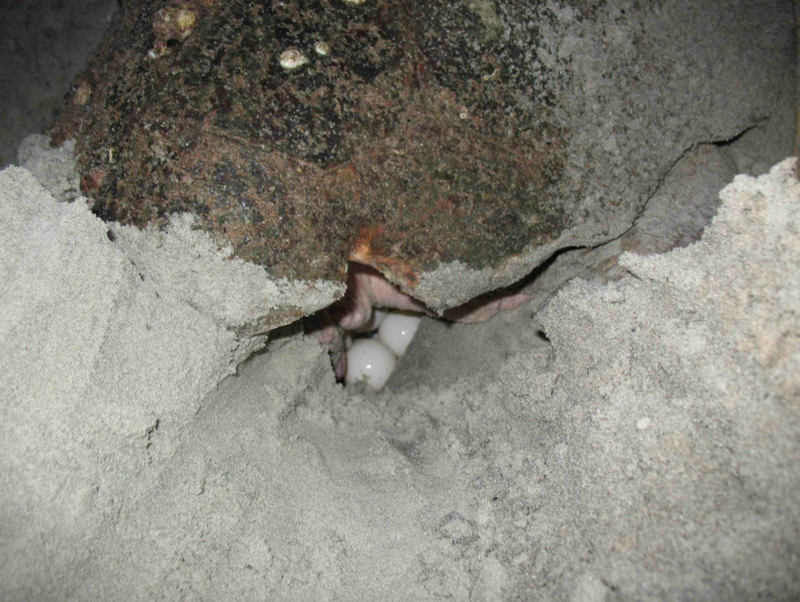 All these phenomena contribute to difficult nesting conditions for loggerhead sea turtles, forcing relocation of approximately 80 percent of “at risk” nests into nurturies. 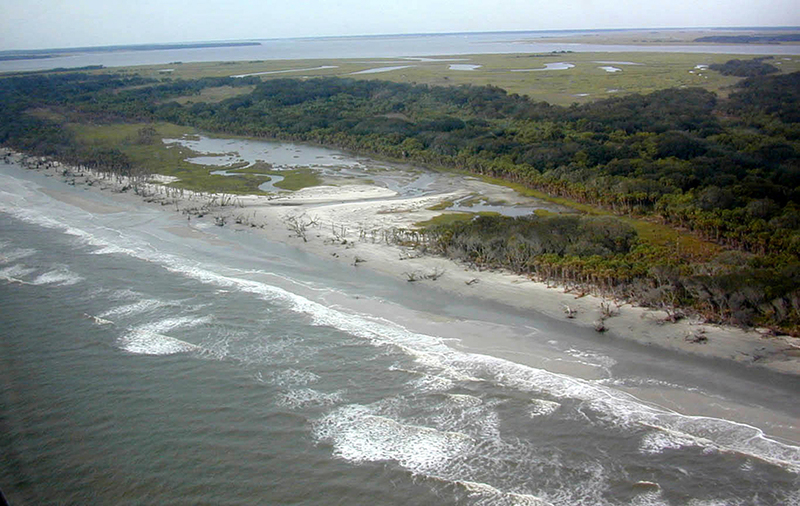 “The Modern Transgression” is driven by rising sea level, impoundment of sediment in coastal rivers to the north decreasing the southward flow of sand along the southeastern coast, and removal of sediment by dredging at ports, such as the Savannah ship channel, exacerbate the disequilibrium of sand moving through the Georgia beach system. 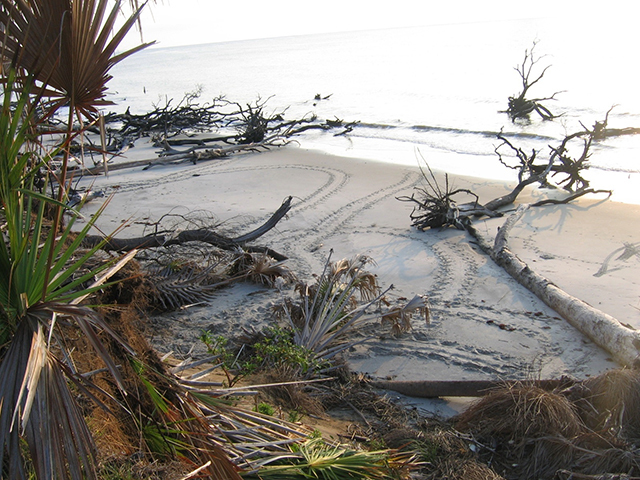 Erosional effects are expected to continue and accelerate as the rise of sea level accelerates, leading to increasing barrier island erosion and deterioration of loggerhead sea turtle nesting habitat on St. Catherines Island, up and down the southeastern coast of the United States, and around the world. Need Additional Information? See www.scistp.org and http/www.GASOU@SCI.edu.